The Washington Court House Lady Lions Basketball team was honored recently by the Washington Court House (WCH) City Council for its second district championship victory against Vinton County 47-45 on Feb. 27. During Wednesday’s council meeting, the council took time to thank the Lady Lions for their dedication and determination, and wanted to remind the community that young people are capable, intelligent and embrace self-growth. Pictured (L to R): front row: juniors Rayana Burns, Shawna Conger and Halli Wall, WCH City Council Chairperson Jim Chrisman, head coach Samantha Leach, and senior Joey Pickelheimer. Back row: WCH City Manager Joe Denen, WCH City Council Vice Chairperson Dale Lynch, WCH City Council member Kendra Hernandez, WCH City Council member Ted Hawk, WCH City Council member Steve Schiltz and WCH City Council member Caleb Johnson. 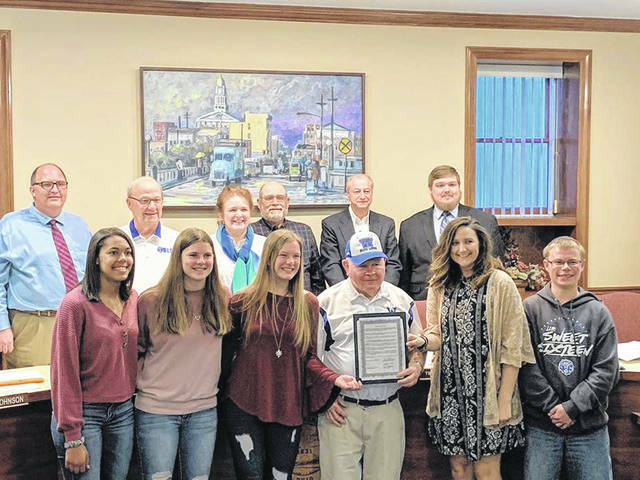 https://www.recordherald.com/wp-content/uploads/sites/27/2019/04/web1_LadyLions.jpgThe Washington Court House Lady Lions Basketball team was honored recently by the Washington Court House (WCH) City Council for its second district championship victory against Vinton County 47-45 on Feb. 27. During Wednesday’s council meeting, the council took time to thank the Lady Lions for their dedication and determination, and wanted to remind the community that young people are capable, intelligent and embrace self-growth. Pictured (L to R): front row: juniors Rayana Burns, Shawna Conger and Halli Wall, WCH City Council Chairperson Jim Chrisman, head coach Samantha Leach, and senior Joey Pickelheimer. Back row: WCH City Manager Joe Denen, WCH City Council Vice Chairperson Dale Lynch, WCH City Council member Kendra Hernandez, WCH City Council member Ted Hawk, WCH City Council member Steve Schiltz and WCH City Council member Caleb Johnson.